A scenario that I have been been looking into recently while testing VSAN in my lab is what happens when vCenter Server is no longer available and the impact that might have on your environment. We know that VSAN from a configuration perspective works very similiar to vSphere HA where vCenter Server is only required for the initial VSAN Cluster configuration. Once the ESXi hosts has been added to the VSAN Cluster, vCenter Server is no longer part of the picture from a functional perspective and the ESXi hosts will know how to communicate with each other within the VSAN Cluster. We can even build a single VSAN node to help bootstrap vCenter Server itself for greenfield deployments. So what does that leave us with? Well, the Virtual Machines of course. The Virtual Machines will continue to run without any impact whether or not vCenter Server is available. VSAN will continue to govern and maintain compliance for the VM Storage Policies that have been assigned to each and every Virtual Machine. However, in the scenario where you can not restore vCenter Server which is primarily where the VM Storage Policies are stored and you need to build out a new environment, how do you go about restoring the VM Storage Policies? Well it turns out that vCenter Server is not the only place where the VM Storage Policies are stored at. To ensure that VSAN can continue enforcing the policies that have been assigned to each Virtual Machine and their associated VMDKs, there is a copy of the VM Storage Policies that is distributed amongst all the ESXi hosts within the VSAN Cluster. In this first first article I will demonstrate how to recover the VM Storage Policies for a particular Virtual Machine running on an ESXi host where vCenter Server is no longer available using a utility located in the ESXi Shell called cmmds-tool. In part two of the article I will demonstrate the same recovery process but leveraging the vSphere API which will be more user friendly. Disclaimer: The cmmds-tool is not meant for troubleshooting, you should only use under VMware GSS/Engineering supervision. If you choose to use it, do so at your own risk. In the ESXi Shell, there is a nifty little VSAN utility called cmmds-tool which stands for Clustering Monitoring, Membership and Directory Services. This tool allows you to perform a variety of operations and queries against the VSAN nodes and their associated objects. One interesting command is the "find" operation which will allow us to lookup a specific VM Storage Policy, a bit more on this later. Now lets say vCenter Server is some how lost or unrecoverable for whatever reason, but we still have access to the ESXi host and the running Virtual Machine. Lets go ahead and recover the VM Storage Policies so we can then rebuild a new vCenter Server and re-create the policies. From the output you will see vsan:// and UUID associated with each VMDK, please make a note of the UUID for each VMDK. We are now ready to query the VM Storage Policy configuration which will help us rebuild the policy in our new vCenter Server. The VM Storage Policy configurations is stored in the "content" field and you will need to translate the properties back to the VSAN policy you have defined. As part of the output you will also see a property called spbmProfileId which is the unique identifier for VM Storage Policy which you can query if you are using the VM Storage Policy APIs that were introduced in vSphere 5.5. Step 4 - To lookup the VMDK VM Storage Policies, we will perform the same command and just replace the UUID with our VMDK UUIDs. 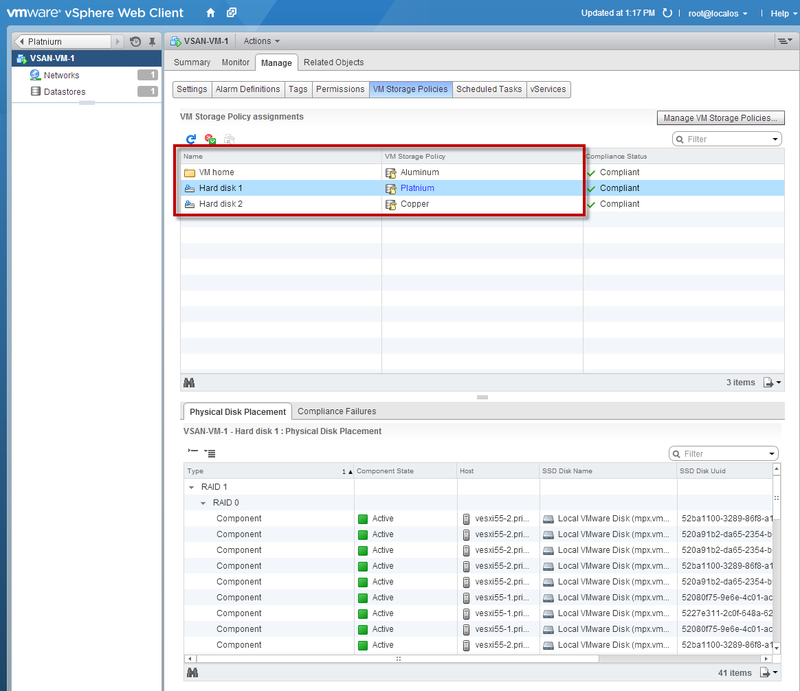 Once you have recorded the configurations for each of the VM Storage Policy, you can then head over to your new vCenter Server and re-create the VM Storage Policies and then re-associate the policy with the Virtual Machines. 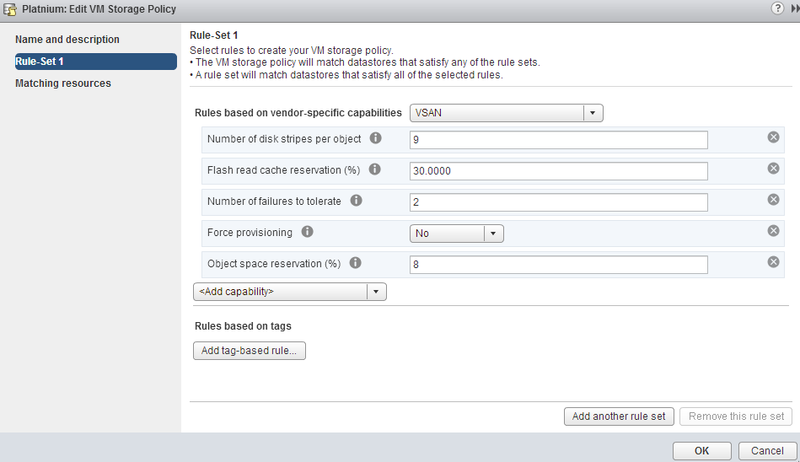 As you can see the steps to recover a VSAN VM Storage Policy is not too difficult but can be a bit tedious. In the next article, we will simplify this by leveraging the vSphere API which has access to the same CMMDS system but make querying the VM Storage Policy super easy by only requiring the user to provide the name of the Virtual Machine. How to bootstrap vCenter Server onto a single VSAN node Part 2? How to bootstrap vCenter Server onto a single VSAN node Part 1? I will forever recommend this storage place and if you know what’s good for you, you will too! I shopped around a lot before choosing this storage place, and they had the best rates I found.